Our Twine and Data expert, Sonja, recently made a visit to the town of Keswick in the Lake District – the unexpected town where a quiet revolution in housing is taking place! 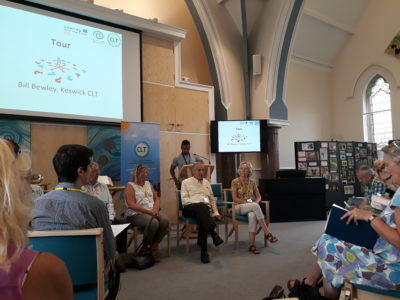 Here, she tells the story of Keswick Community Housing Trust, as presented at an event they hosted with the National Community Land Trust Network. Keswick is a very small town in the middle of the Lake District, a tourist destination popular for walking. In the centre of town, you will find yourself surrounded by happy couples and pensioner groups, looking very upper middle class and eating ice cream. This does not look like a place where you would expect economic problems and a need for community business, I thought at first. Speaking to the trustees of the Keswick Community Housing Trust, though, the picture immediately became clearer. The group was set up in 2009, after a series of church network meetings which all highlighted social problems related to housing. “It was just obvious that whether we were talking about health, or schools, or opportunities for young people, we would always end up with housing as the core of the issue,” says chairman Bill Bewley. Housing is an issue in Keswick because holiday houses have become so popular in the area that prices increased dramatically. This made it so much more attractive to landlords to offer their properties to tourists rather than locals, that tenants were frequently forced out of their homes by price or by a cancelled tenancy agreement. “We really started this (community land trust) when we realised that our children would never be able to afford their own home here,” says Joyce, who is part of the board. And that is a problem affecting the very existence of Keswick’s community: any town needs tradesmen and people working in the services sector – if these people cannot afford to live in the area, what are the local well-to-do seniors supposed to do when they need a doctor? The group in Keswick was a pioneer of the community land trust movement, therefore had to find its own way on how to solve the housing problem. They knocked on the doors of churches, and found land at the end of a graveyard that the church was glad to hand over. They offered community shares and raised 60,000 pounds in just two months, which convinced the local building society to give them a mortgage for building their first set of community homes. ‘The Hopes’ – as these homes became affectionately known as – now house 11 parties with some owned and some rented. The community land trust completed three further building projects over the next few years, resulting in homes for over 100 local people at more affordable rates. There is a high demand for their properties, and the board allocates them based on economic need, as well as the applicants’ relationship to Keswick and track record of community contribution.